New Jerusalem is composed of pure, precious materials but Babylon is only gilded with them. 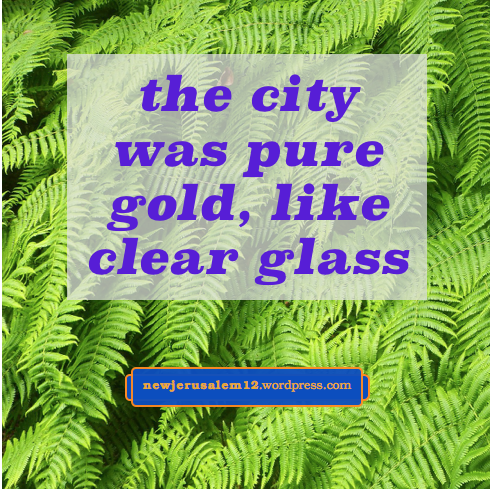 New Jerusalem is pure, clear, transparent. But Babylon, behind the gilding, is “full of abominations and the unclean things of her fornication.” Babylon is a mixture—abominations cloaked in precious things. Abominations hidden in a good covering is not new in Revelation. The Lord Jesus speaks of many examples in the Gospels. One is, “Woe to you, scribes and Pharisees, hypocrites! For you resemble whitewashed graves, which outwardly appear beautiful but inwardly are full of dead men’s bones and all uncleanness” (Matt. 23:37). James 4:8 guides us: “Draw near to God, and He will draw near to you. Cleanse your hands, sinners, and purify your hearts, you double-souled!” Our heart is for loving. Lord, purify us from any doubleness, save us from any mixture of loving You while loving other things. Bring us to loving You with our whole heart. The pure in heart will see God and will be prepared as constituents of the pure city, New Jerusalem. This post is based on the first part of chapter 5, “The Holy City, New Jerusalem,” in The Glorious Church by Watchman Nee. This book can be freely downloaded from Bibles for America (English) or Rhema Literature (30 languages). Israel’s journey to Mt. Sinai depicts our Christian journey to a spiritual mountain. After some time at Mt. Sinai, Israel received the vision of the tabernacle, God’s dwelling place. At our mountain we see the vision of New Jerusalem, God’s eternal dwelling place. The Lord Jesus presented the reality of the kingdom of the heavens on a mountain (Matt. 5–7). Three disciples saw His transfiguration, “the Son of Man coming in His kingdom” on a mountain (Matt. 16:28-17:13). This brief time was a foreshadowing of the millennial kingdom which leads into the eternal kingdom of New Jerusalem. The Lord’s words concerning the course of this age and His coming again were spoken on a mountain (Matt. 24:3). 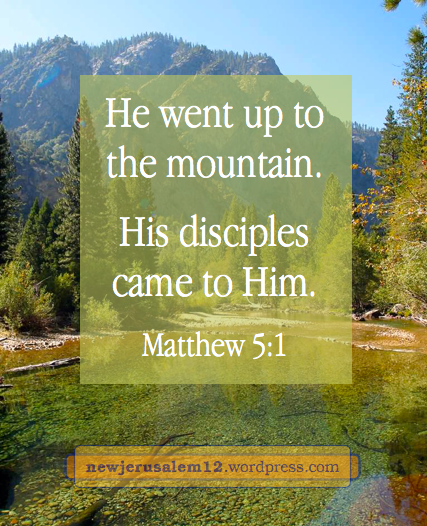 His sending of the disciples to proclaim the gospel to all the nations was also accomplished on a mountain (Matt. 28:16). Then they saw His ascension from the mount of Olives (Acts 1:9-12). These events present the need for being on a mountain for key spiritual experiences, including the vision of New Jerusalem (Rev. 21:9-10). How do we get there? We pray and our prayer brings us to the Lord. As long as we are with Him, when He is on the mountain, we will be there too. (And when He is beside the sea to gospelize, we will be there with Him.) Our need is to come to Him. “His disciples came to Him” (Matt. 5:1). Lord, draw me daily. Stir me to come to You all the time so that I may receive Your speaking. Lord, make me a Mary, one who sits are Your feet and listens to Your word (Luke 10:39). Lord, draw me until You can show New Jerusalem to me. Andrea’s post about the heavenly vision.